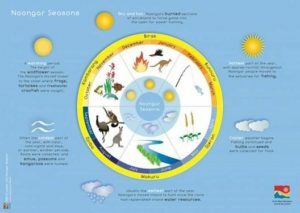 Tracking Noongar seasons can be very useful in anticipating weather changes and their effects on our gardens. We are fast approaching Djeran, the Noongar season beginning around April, signalling the start of cooler weather with a little rain. Noongar people used this time to prepare for winter, and we can do the same with our gardens! This is a great time to start adding wetting agents to our garden beds, lawns and pot plants. Give them all a good feed with a slow release fertiliser and add lots of organic matter and compost to your fruit trees. When adding mulch to your garden beds, make sure you use a chunky, preferably local, mulch with lots of uneven parts. Lay it on your garden beds at 100mm thick (just over 4 inches in the old school). Your garden will thank you come the wetter, winter season of Makuru! Throughout all Noongar seasons, Chorus provides customers with the opportunity to work with our Water Wise specialists to help you remodel your garden in a sustainable manner. For more information on Chorus gardening services, please call 1800 264 268.